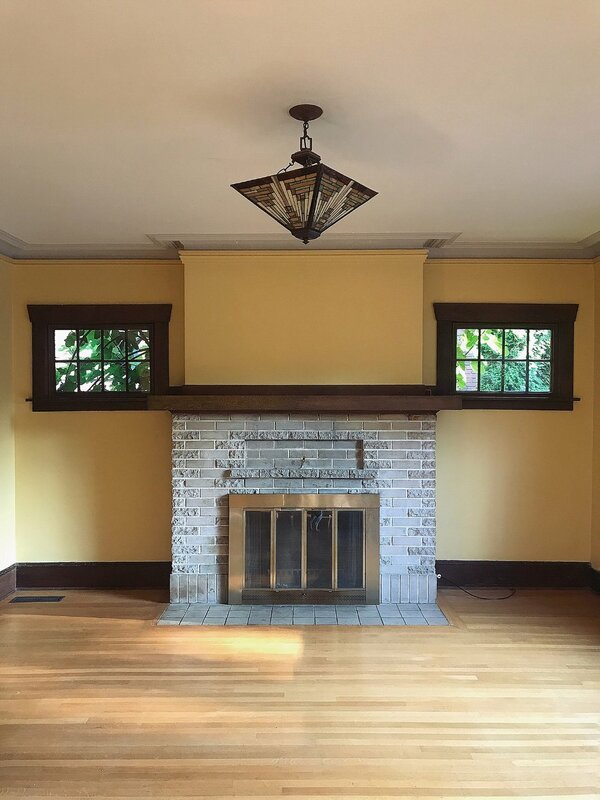 As soon as we received an accepted offer on the house I went to google and yelp to start researching flooring companies to refinish the yellowish floors as well as local companies that specialize in plasterwork to skim coat the walls in the house. These two elements were on the immediate to-do list because smoothing out the super ugly texture on the walls is something that I know we would never go back to once we started moving our furniture in and same goes for the floors. I believe the textured walls were done in the 40s or 50s to hide cracks from the foundation settling. I’ve seen these kinds of cracks in my parents home that was built in 1801 and know from them that it’s a huge undertaking to fix but never until I moved out here have I seen so many textured walls - which probably has something to do with earthquakes. Although the texturing is just a band-aid, we do know that the previous owners went through the process of leveling the first floor and making it seismic safe. So I believe we are ‘okay’ for the time being in terms of seeing any new cracks for a while. To add insult to injury the entire house was painted with colors that I can only imagine were inspired by fruits of the garden(?). We found paint cans labeled red delicious and granny smith green. The red delicious unevenly painted on top of the textured walls in scene looked more like an interior of a stomach than a fresh apple. 😫 So after several calls I landed on a company that had the capability to skim coat with plaster as well as paint for us. They were also willing to start when we needed them to and finish in time for us to move in before our lease on the cottage was up. After settling on a plaster company, I also started looking for flooring companies to refinish the floors. When we moved into the apartment this was something we didn’t have the liberty to do, due to time constraints and we regret it still to this day. Oh what I would do for refinished floors in our apartment in Brooklyn… We decided we were not going to make that mistake on this house and booked a flooring company to come in immediately after the plaster company finished. We closed within a month and literally started the walls and floors within a week of getting the keys. I will say the plaster company did a pretty good job. There are areas where they could have been better about the finish, and it seems as though they were a little lazy about painting the primer evenly. But these are areas that only I will ever know about. Oh well, this is the reality of buying and fixing up old houses. And another example of how you have to be detailed and not let anything slip by while you still have the contractors on site. Would I recommend the company we used? If someone asked for the name I would, but I would recommend you schedule time for a final walk through to ensure everything is completed according to your expectations. I do have to admit the greatest issue we found and admittedly we are embarrassed that it took so long for us to notice, was that they covered up two locations where light fixtures were located pre-skim coat. A little back story to how that even happened: Before the work commenced we needed to remove all the light fixtures from their wiring, which is also when we realized the upstairs although recently rewired to have smoke alarms and up-to-code outlets, was never updated from the knob and tube wiring. That has resulted into another hefty electrical bill that we will be paying, to rewire all the lights from knob-and-tube to modern wiring. So after we removed the light fixtures we left the wires exposed. In two locations in the hallway they just flat out covered the old light locations! And since we had shut the electrical off upstairs soon after move in, we didn’t notice this probably for several weeks! The flooring company came in the day after the plasterers finished and they did a wonderful job. They were easy to work with and finished in less time than they estimated. That company is called European Hardwood Flooring. We have all white oak top nail flooring on the main floor, which we sanded down and have refinished in the Early American stain. I wanted it to look like Parisian apartment floors and this was the closest match we could get. Upstairs the floors are all fir because they were probably always carpeted. Since fir and oak are completely different in look and how they take stain we chose to do a completely different stain upstairs - because why try to match if it’s not even possible. Some people I imagine would pay the extra money to tear up the fir and replace with oak, but that wasn’t in our budget. So we chose a dark stain called Spice Brown for the fir floors. The finish is a satin Acid-Cured Swedish finish. Satin because I am not a fan of super glossy floors and the Swedish Finish is supposed to be the toughest and strongest wearing quality floor finish. Upon move in we were able to enter a house with smooth primer fresh walls and beautifully finished floors. Worth the diligence on my part in setting up the contractors as soon as possible. Above: 1) is the flooring post stain, pre-finish 2) 1 layer before the final finish 3) Inspiration image from a Jessica Helgerson Interior Design Project. Here’s a little side-by-side of the before and after of the walls. It makes a huge difference! So there we have it. Now it’s on to the more fun stuff… decorating. I can’t wait to show you what’s up next. Thanks for reading!